Many of you may be familiar with the blog Cardboard Gods, it's writer and creator, Josh Wilker, has a unique ability to weave baseball cards into the fabric of his life's stories and is poised to take that one step further with the pending release (April 1st, 2010) of is new book of the same name. I have received an advanced copy from the publisher for review but have been asked to wait posting the review until closer to the book's release date. However, I wanted to share with you the scope of the topic and what some other noteworthy authors are saying about the book. 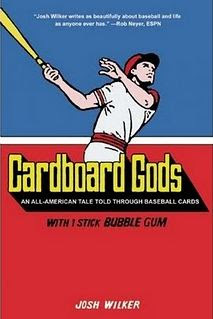 "Cardboard Gods is the memoir of Josh Wilker, a brilliant writer who has marked the stages of his life through the baseball cards he collected as a child. It also captures the experience of growing up obsessed with baseball cards and explores what it means to be a fan of the game. Along the way, as we get to know Josh, his family, and his friends, we also get Josh’s classic observations about the central artifacts from his life: the baseball cards themselves. Josh writes about an imagined correspondence with his favorite player, Carl Yastrzemski; he uses the magical bubble-blowing powers of journeyman Kurt Bevacqua to shed light on the weakening of the powerful childhood bond with his older brother; he considers the doomed utopian back-to-the-land dreams of his hippie parents against the backdrop of inimitable 1970s baseball figures such as “Designated Pinch Runner” Herb Washington and Mark “The Bird” Fidrych. Cardboard Gods is more than just the story of a man who can’t let go of his past, it’s proof that — to paraphrase Jim Bouton — as children we grow up holding baseball cards but in the end we realize that it’s really the other way around." "Josh Wilker has pulled off as nifty a double play as Tinker-Evers-Chance ever executed in Cardboard Gods, reimagining the baseball cards of his youth and effortlessly turning them into a lamp to shine on his own memories in this fascinating read." - Bert Randolph Sugar, author of Bert Sugar's Baseball Hall of Fame: A Living History of America's Greatest Game.
" A warm, rich and funny recollection of one American boyhood as viewed through the unimpeachable prism of baseball cards. Literate, nostalgic and sneaky fast." The book is available for presale on Amazon and stay tuned for my own review next month. The author of www.sportscardsuncensored.com has written an excellent article. You have made your point and there is not much to argue about. It is like the following universal truth that you can not argue with: The smaller the monkey the more it looks like it would kill you at the first given opportunity. Thanks for the info. Huh!?!?! WTF are you talking about? I can not wait for this book! I love Josh's writing.